Ashura in Iraq: Enter Mahdism? If press reports concerning the ongoing battle between armed militants and Iraqi government forces near Najaf are correct, this could mark a dramatic new development in the Iraq situation… Full story here. Posted in UIA dynamics | Comments Off on Ashura in Iraq: Enter Mahdism? There are intriguing implications to the recent arrest by a joint US-Iraqi force of two members of the provincial council in Kut. Behind the names of the arrestees some interesting political ties emerge: the two happen to be very closely affiliated with SCIRI. One of them, Fadil Jasim, was also arrested by US forces in 2005 in connection with allegations about election fraud in Kut – an episode in which charges about Iranian involvement were put forward. What is going on here is unclear. Has SCIRI decided to launch some kind of US-assisted internal purge, possibly with the aim of presenting itself as a “moderate” partner for Washington? Is Maliki finally beginning to override the narrow interests of some of the militant elements that form part of his ruling coalition? Or is the United States acting unilaterally? Some reports describe the incident as an “American” rather than as a “joint” operation, and it more or less coincided with US arrests of Iranian “diplomats” in Iraq – detentions about which SCIRI strongly protested, especially the ones that took place inside the compound of Abd al-Aziz al-Hakim in Baghdad. What Exactly Is Washington Surging for in Iraq? The speech by President George W. Bush to the American nation on 10 January 2007 may have been his last chance to bring radical change to his Iraq policy. As such it was a relatively unremarkable affair – a slight rephrasing of old goals, with some italics, bold types and imperatives added here and there. Full story here. Posted in US policy in Iraq: Leverage issues | Comments Off on What Exactly Is Washington Surging for in Iraq? Over the past year, increasing numbers of American commentators have suggested various “territorial” solutions designed to extricate U.S. forces from Iraq. These proposals have come in several guises, involving different degrees of decentralization and compartmentalization: “Soft partition,” “controlled devolution,” and ­“Dayton-­style détente” (a reference to the 1995 Bosnian settlement) are but a few of the concepts that have kept policymakers in Washington busy of late. All these proposals assign a role to foreign hands in drawing up internal federal or confederal border lines that would drastically reshape the administrative map of Iraq. 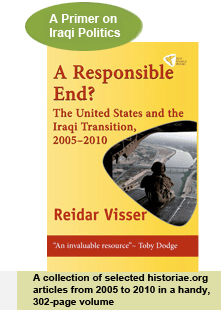 At the very least, they foresee a role for the United States in “advising” the Iraqis on how to implement this process of demarcation, as, for instance, Senator Joseph Biden (D.-Del.) has advocated…Full story here.